Thanks, Phat. Good to see a reasonable, thought-out response after that reddit nonsense. I missed a whole like 6 days, so I am going to be forced to wait to see how the market goes... and I don't expect that to be a bad thing! If the market is too low, I'll wait. Too high (everyone starts posting 500k and I see no movement), I'll offer to "pre-sell" mine at a somewhat lower rate. Who doesn't love a deal? I agree, people are getting crazy. I have two engys and missed two of my CDs due to IRL obligations that had me out of town without WoW. I must say, with the craziness of the new armor from CDs, I'm somewhat glad that I'll have a few days to let the market sort itself out. Sure it would have been great to get it the first day and sell it for some insane price, but some people don't read mmo-champion or patch notes, and maybe haven't even seen the mount. I think that when this mount gets more exposure in the game, people are going to really want it. Another thing is, how many people who really can afford to spend hundred of thousands of gold on a mount don't have an engy to make one for themselves? Quoting the comment above: "Another thing is, how many people who really can afford to spend hundred of thousands of gold on a mount don't have an engy to make one for themselves?" This. And don't forget you only need one per account. I made the rocket and relisted it over 100 times against three or four other competitors before I gave it to a friend. I'm cutting to the chase this time and just making the Sky Golem for myself. When a pattern has no gateway, such as gaining rep to attain it, there's not a whole lot of point listing it on the AH. And this mount takes no major gold investment, just a daily CD. I wish everyone selling it the best of luck! And in the worst case scenario, you'll have a cool mount for yourself! As Engineering is currently one of the professions i dont have, i will be looking to snag one of these cheaply in about a weeks time. I think there will be the highest quantity of them available in about 7 days time. Most people will have missed at least one daily CD if not two or three so anyone who wanted to make one will be selling it within the next week. Once they realise that they wont be the half million gold maker, they will either look to sell it cheap to make something back, or use it themselves. And i doubt they will be making another one if that is the case. That will be time for Manthieus to swoop in with a lowball offer and snag a bargain! (yes i just referred to myself in 3rd person) Im aiming for no more that 30k! I think the real question is: Make the pets, or make the mount? The pets take exactly half the crafting materials of a mount, so if you can sell a pet for more than 50% of what the mount would sell for, that's obviously the way to go. Considering TUJ has never seen either pet on the AH on my server, it's pretty clear all the engineers are waiting to make the mount. On my server people are already posting them at 70k as the lowest. There are 33 up on the market at the moment and 12 of them are well under the 100k mark. I've missed crafting the Jard a few times so I won't have all 30 until Sunday. I'm a bit gutted that I won't be able to get my own there as part of the initial rush but meh. My plan is to keep an eye on the prices on my server AH. 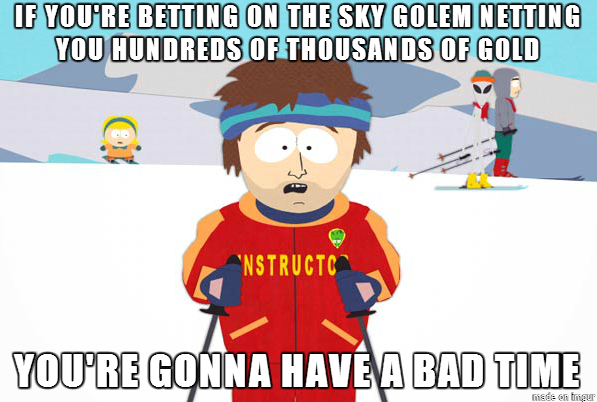 I will be putting my Sky Golem on there for whatever I think is reasonable in terms of both profit and a realisitic price that someone will pay. If it sells that's excellent and I'll start crafting a second one for me - if not, I've got myself a new mount (sooner than expected). This tactic worked well when I crafted my first Chopped :) I made enough profit to cover ~50% of the cost of crafting a second one, meaning mine was effectively half price! Currently 90k-200k on my realm, first day. About 10 on the AH so far. Had no serious expectations going into this one. Will hold for a lil bit, otherwise I've got a new mount to learn. Just as with any market though, I can't stand dramatic price gouging. No one is buying them from any of the known sellers yet and in 5 hours it's already tanked from 250-120 from the price gouging that I've stayed out of.